Department of Neurology, The Laboratory for Dementia and Parkinsonism, Translational Neurotherapeutics Program, Georgetown University Medical Center, Washington D.C. The microtubule-associated protein 'tau' is primarily expressed within axons in the central nervous system where it stabilizes microtubules and aids in cargo transport. While basal phosphorylation of tau is normal, tau modifications, predominantly hyperphosphorylation, are critical in the pathogenesis of numerous neurodegenerative disorders known as the tauopathies. Over the years, tau has been shown to be a valuable and elusive target for the treatment of neurodegenerative diseases. Targeting tau via genetic, biological, and pharmacological approaches in vitro and in vivo may prevent degenerative pathologies. However, to date none of these approaches have been successful in human studies, albeit some promising studies are currently underway. This review aims to briefly discuss the biology and pathology of tau and summarize current treatment strategies in clinical trials. Tau was first characterized in 1975 as a protein responsible for assembling α- and β-tubulin to form microtubules. This protein is encoded by the microtubule-associated protein tau (MAPT) gene on chromosome 17q212 and is divided into four components: an amino-terminal region, a proline-rich domain, a 3 or 4-repeat microtubule-binding domain, and a carboxy-terminal region. 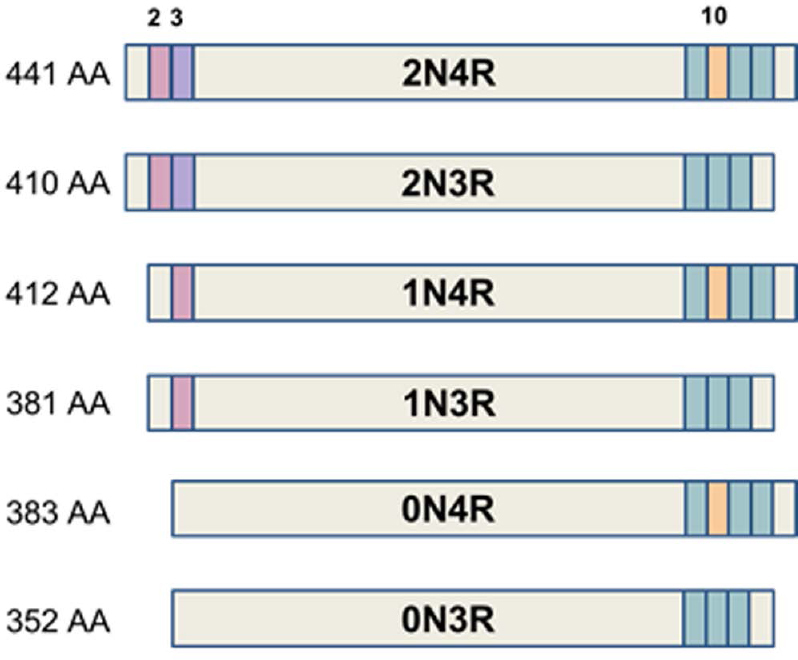 Tau has six isoforms, ranging from 352 to 441 amino acids expressed in the adult human brain generated by alternative splicing of exons,, and 10., The isoforms are named according to the absence of exons 2 and 3 (0N), presence of exon 2 (1N), or presence of exons 2 and 3 (2N) and whether exon 10 remains in the microtubule-binding domain for a total of 4 repeats (3R or 4R) [Figure 1]. Figure 1: The amino acid (AA) length, composition, and nomenclature of the six tau isoforms. Tau dysregulation is associated with a group of neurodegenerative diseases known as the tauopathies. These include frontotemporal dementia with Parkinsonism More Details linked to chromosome 17 (FTDP-17), progressive supranuclear palsy (PSP), Alzheimer’s disease (AD), corticobasal degeneration (CBD), argyrophilic grain disease (AgD), among others.,,,, Additionally, tau modifications are found in the majority of neurodegenerative diseases, including Parkinson’s disease (PD), Huntington’s disease (HD), multiple sclerosis (MS), and amyotrophic lateral sclerosis (ALS).,,, While the tauopathies share a common pathological protein, they may have a different predominant isoform [Table 1] and exhibit a broad range of symptoms of the scale of Parkinsonism and dementia, largely correlating with the amount and location of the tau burden. There have been numerous successes modeling tau pathology in transgenic mouse models, some of which are summarized in [Table 2]. Many of the animal models utilized in research express human P301L tau, which is the most common mutation associated with FTDP-17., This tau mutation is very aggressive and a well characterized tau mutation,, in experimental preclinical models. Other tau mutations including P301S have also been studied, but considering the identified 100 mutations of tau in human pathology and the absence of tau mutations in AD, more research is needed to better understand the effects of tau on human disease. Additionally, the need for further investigation of other tau mutations may render data obtained from pre-clinical models more translatable to human clinical studies. This is important because tau pathology does not seem to be specific to certain diseases, and tau may constitute a common marker of several human diseases as a genetic risk factor, that is not necessarily associated with a specific gene mutation. The variability of tau species that are generated from several post-transcriptional (splicing) and post-translational (ubiquitination, phosphorylation etc.) modifications may limit the validity of existing transgenic and preclinical models. The growing prevalence and cost of tauopathies stresses the need for effective treatments. There are few drugs available to address the symptoms of tauopathies and no disease-modifying drugs or cures. There are, however, FDA-approved treatments for AD: acetylcholinesterase inhibitors, including donepezil, galantamine, rivastigmine and the glutamate receptor NMDA antagonist memantine. Interestingly, these drugs have shown little, no, or negative effects in patients with non-AD tauopathies. Largely, patients with tauopathies receive antidepressants such as selective serotonin reuptake inhibitors (SSRIs) to treat the behavioral symptoms related to the disease. It is of note that these drugs are not FDA approved for FTD, PSP, CBD, etc. and are given off-label. In addition to intracellular tau pathology, AD patients exhibit extracellular plaques composed of amyloid beta, a cleavage product of the amyloid precursor protein (APP). APP cleavage by β- (BACE1) and γ-secretases promote formation of amyloid beta, and α- and β-secretases are involved in the non-amyloidogenic pathway. Many clinical trials for AD thus far have been targeting Aβ production or destruction, largely by inhibiting enzymes which cleave APP or reducing Aβ with Aβ-vaccines. Eli Lilly and Biogen were among the first to introduce anti-Aβ vaccines or BACE1 inhibitors to clinical trials. These Aβ-directed treatments are not without side effects, and most have been discontinued for a variety of reasons. For example, the antibody bapineuzumab led to reversible vasogenic edema in 12 of 124 patients, a side effect now under the umbrella term of ARIA or amyloid-related imaging abnormalities. Semagacestat, a γ-secretase-inhibitor trial was halted due to worsening of cognition and increased risk of infections and skin cancer, among other concerns. The β-secretase inhibitor verubecestat was also terminated, following conclusions from the study’s data monitoring committee. Aβ therapies are still currently under investigation, though tau-based treatments are an emerging new paradigm. [Table 3] provides a summary of clinical trials targeting tauopathies which will be discussed below. A balance of phosphorylation and dephosphorylation is required for tau to properly support the function and structural integrity of neurons., Phosphorylated tau is unable to promote microtubule assembly,, and in more pathological states, tau is hyperphosphorylated and forms intracellular protein aggregates. Thus, the stabilization of microtubules is a target for tauopathy treatment. Microtubule (MT) stabilizers are often used for cancer, though studies suggest they may be useful in tauopathies to support the axons after tau dissociates from MTs and aggregates. Dictyostatin is a MT-stabilizing agent which was found to promote neuronal survival and MT density in PS19 mice. BMS-241027 (Epothilone D, Bristol-Myers Squibb) is a MT-stabilizing drug which decreased tau pathology in rTg4510 mice and PS19 mice. A Phase 1 clinical trial with BMS-241027 for mild AD (NCT01492374) was completed in October 2013, and there are no current trials with the drug. Hyperphosphorylated tau (p-tau) has been shown to affect the function of normal tau and sequester it into a pathological form., Homogenates from human brain tauopathies can induce tau pathology in mice, demonstrating pathological effects of human p-tau. There is some debate as to which forms of tau may be pathological,,, as well as the route by which soluble tau becomes filamentous or associated into paired helical filaments (PHF). It is believed that tau dimerization is a critical step in the formation of filamentous tau., The traditional thought is that tau monomers follow a single pathway toward the formation of neurofibrillary tangles (NFTs); tau assembles into higher forms such as dimers and oligomers which can then give rise to PHFs.,,, PHFs are the primary component of NFTs,,, along with ubiquitin, and high molecular weight, phosphorylated neurofilament, as well as other proteins., Less is known about straight filaments (SFs), though they are similar to PHFs, and both can form neuropil threads, presumably replacing neurofilaments in neuritis. Studies have shown dephosphorylation of PHFs can help restore tau function and shift PHFs into a lower confirmation., In addition to NFTs, tau is a component of other disease-related inclusions such as Lewy bodies,, in dementia with Lewy bodies (DLB) and Pick bodies in Pick’s disease, which are variable forms of dementia. Davunetide, developed by Allon Therapeutics, is a peptide composed of eight amino acids (NAPVSIPQ) delivered intranasally. The peptide showed promise in in vivo studies using a K257T/P301S mouse model, decreasing levels of p-tau, increasing levels of soluble tau, and improving cognition on the Morris water maze (MWM). In a Phase 2/3 study in patients with PSP (NCT01110720), davunetide was shown to be well tolerated but had no efficacy for PSP. Another Phase 2/3 study in MCI (NCT00422981) also showed the drug to be safe but provided no significant differences in composite cognitive memory score. A Phase 2 study in patients with predicted tauopathies (NCT01056965) was completed in July 2017. In addition to phosphorylation and microtubule stabilizing, tau clearance is a promising target. The buildup of toxic proteins is a common feature among most neurodegenerative diseases. These proteins, including tau, can be cleared in several ways such as the ubiquitin-proteasome system (UPS) or autophagy.,,, A study with R406W mutant tau drosophila showed 1 µm rapamycin food treatment cleared aggregate-prone tau. Trehalose was shown to promote tau degradation, and another study with P301S mice treated with water containing 2% trehalose prevented cell death and reduced p-tau levels. Methylthioninium chloride (methylene blue, MB) was shown to decrease tau aggregation and stimulate autophagy.,,,,,,, One group found 0.02 mg/kg MB stimulates autophagy and decreases both total tau and p-tau in JNPL3 (P301L) mice after two weeks of treatment via oral gavage. Another group showed a 5 month treatment with water containing 6 µg/mL MB reduced p-tau in the sarkosyl-insoluble fractions without affecting total tau in JNPL3 mice. TauRx Therapeutics Ltd performed several studies with the MB formulation TRx0014 (Rember®), showing some beneficial effects. There is growing evidence of possible relation between Abelson (Abl) and tau pathology,,, and treatment with tyrosine kinase inhibitors (TKIs) targeting Abl such as nilotinib (Tasigna®, Novartis) or bosutinib (Bosulif®, Pfizer) reduces p-tau levels in different models of neurodegenerative diseases,,, by stimulating autophagy rather than reducing phosphorylation. Imatinib (Gleevec®, Novartis), another Abl inhibitor, was also shown to reduce p-tau levels. As with the amyloid beta vaccines, clearance via immunization is of interest. Numerous animal studies have been performed with liposome-based, passive, or active immunization to determine safety and efficacy of these biologics,,,,,,,,,, leading to a number of anti-tau vaccines developed for humans. RG7345 (Roche) is a passive vaccine against tau 416-430, following preclinical evidence showing value in targeting serine 422., RG7345 was tested in a Phase 1 trial with healthy volunteers (NCT02281786) and was listed as removed from Phase 1 on the company website. Another vaccine, ACI-35 (AC Immune), a liposome-based vaccine which targets tau 393-408, completed clinical trials for mild-to-moderate AD (ISRCTN13033912) and was licensed to Janssen Pharmaceuticals in 2015. TRx0237 (LMTX™) is a newer MB formulation from TauRx Therapeutics Ltd, intended to have greater bioavailability than TRx0014. It was tested in Phase 3 trials for mild AD (NCT01689233), mild-to-moderate AD (NCT01689246), and behavioral variant of FTD (bv-FTD) (NCT01626378). TRx0237 did not show effects on the primary or secondary outcome measures in mild-to-moderate AD, though post-hoc analyses revealed some benefits of TRx0237 monotherapy. There is one ongoing, Phase 3 extension study (NCT02245568) of TRx0237 in AD and bv-FTD with patients enrolled in previous Phase 2 or 3 TRx0237 trials. TPI-287 (Cortice Biosciences) is an MT-stabilizing drug being tested for various cancers in addition to neurodegenerative diseases. It is currently in Phase 1 clinical trials for AD (NCT01966666) and PSP, CBD, and primary four repeat tauopathies (4RT) (NCT02133846). Nilotinib is currently in clinical trials II for mild-to-moderate AD (NCT02947893) after an intriguing, open-label Phase 1 study (NCT02281474) in patients with PD with and DLB showed some preliminary positive effects on cognition in advanced patients. In addition to PD and DLB, Nilotinib has recently been tested in patients with chronic cerebellar ataxia and was found to be beneficial. Another TKI, AZD0530 (saracatinib, AstraZeneca), is a Fyn-targeting drug originally developed as a potential cancer therapeutic. A Phase 1b trial (NCT01864655) showed AZD0530 was well tolerated, and an ongoing Phase 2a trial for AD (NCT02167256) is set to be completed in December 2017. Bristol-Myers Squibb recently licensed their N-terminalfragment-targeting antibody BMS-986168 to Biogen. BMS-986168 has been evaluated in healthy volunteers (NCT02294851) and is currently being tested in a Phase 1 trial with PSP patients (NCT02460094), in an extension study (NCT02658916), as well as a Phase 2 trial (NCT03068468) also for PSP. C2N-8E12/ABBV-8E12 (C2N Diagnostics, AbbVie) is another passive vaccine targeting the N-terminus. This is being tested in a Phase 1 trial with PSP patients (NCT02494024), Phase 2 trials in PSP (NCT02985879), and early AD (NCT02880956). Preclinical work with the monoclonal antibody DC8E8 led to the active tau vaccine AADvac1 (Axon Neuroscience SE) based on the tau 294-305 peptide., A Phase 1 trial (NCT01850238) with AADvac1 showed both safety and immunogenicity, and an 18-month follow up study (NCT02031198) was completed in December 2016. A Phase 2 trial in patients with mild AD is currently underway (NCT02579252) in addition to a Phase 1 trial for non-fluent primary progressive aphasia (PPA) (NCT03174886) in the works. As the field of neurodegenerative disease research expands, tau remains useful to study the pathogenesis and progression of human tauopathy as well as for drug development with countless successes on the bench and promising trials underway. There are areas to improve preclinically that may lead to drugs and biologics with better efficacy entering clinical trials. The physiological relevance and translatability of cell culture results and animal models to human disease represent a fundamental challenge to tau research. With regard to current trials, it appears that two hypotheses are currently at the forefront on neurotherapeutic research to reduce tau pathology: the concept of neuronal clearance of tau via autophagy and second, the hypothesis that anti-tau vaccines can capture secreted tau en route from one neuron to another. Experimental evidence supports the autophagy concept. Normal tau and microtubule function appear to be critical to baseline autophagy that can mediate clearance of multiple toxic proteins such Aβ, tau, and alpha-synuclein., Pathological tau can sequester and convert normal tau, so the ability to degrade p-tau would not only restore neuronal function but also prevent further propagation. In addition to nilotinib and AZD0530, other TKIs are also being explored as treatment options. Anti-angiogenic TKIs such as pazopanib are in preclinical studies for AD by our group as well as others. Masitinib is a mast/stem cell growth factor receptor (c-KIT) inhibitor tested in patients with mild to moderate AD as an adjunct therapy (NCT00976118).,, With the number of FDA-approved TKIs that are able to modulate autophagy with extensive preclinical and clinical research already available and a diverse set of targets, this is an area of growing interest. Meanwhile, anti-tau vaccines still have to be tested for safety, as anti-Aβ vaccines have not been devoid of safety concerns. In humans, little is known about what constitutes a normal level of tau in the interstitial fluid (ISF), cerebrospinal fluid (CSF), and within neurons. Some work has been done in P301S mice, demonstrating a decrease in normal tau in the ISF and an increase in CSF tau as it aggregates in neurons. It is unclear whether vaccines that reduce extracellular tau levels may alter the stoichiometry between CSF, ISF, and neuronal tau, and if antibody therapy reaching portions of the brain unaffected by disease could have negative consequences. It is possible that accelerating p-tau clearance inside the neuron by stimulating autophagy is more plausible than vaccines which target secreted tau that has already damaged the neuron. Taken together, the shift from amyloid beta to tau-focused research in addition to an increase in trials testing repurposed TKIs and antibodies shows a directional change in the field. Weingarten MD, Lockwood AH, Hwo SY, Kirschner MW. A protein factor essential for microtubule assembly. Proc Natl Acad Sci U S A. 1975;72:1858-1862. Neve RL, Harris P, Kosik KS, Kurnit DM, Donlon TA. Identification of cDNA clones for the human microtubule-associated protein tau and chromosomal localization of the genes for tau and microtubule-associated protein 2. Brain Res. 1986;387:271-280. Goedert M, Spillantini MG, Jakes R, Rutherford D, Crowther RA. Multiple isoforms of human microtubule-associated protein tau: sequences and localization in neurofibrillary tangles of Alzheimer’s disease. Neuron. 1989;3:519-526. Goedert M, Spillantini MG, Potier MC, Ulrich J, Crowther RA. Cloning and sequencing of the cDNA encoding an isoform of microtubule-associated protein tau containing four tandem repeats: differential expression of tau protein mRNAs in human brain. EMBO J. 1989;8:393-399. See TM, LaMarre AK, Lee SE, Miller BL. Genetic causes of frontotemporal degeneration. J Geriatr Psychiatry Neurol. 2010;23:260-268. Short RA, Graff-Radford NR, Adamson J, Baker M, Hutton M. Differences in tau and apolipoprotein E polymorphism frequencies in sporadic frontotemporal lobar degeneration syndromes. Arch Neurol. 2002;59:611-615. Feany MB, Dickson DW. Widespread cytoskeletal pathology characterizes corticobasal degeneration. Am J Pathol. 1995;146:1388-1396. Joachim CL, Morris JH, Kosik KS, Selkoe DJ. Tau antisera recognize neurofibrillary tangles in a range of neurodegenerative disorders. Ann Neurol. 1987;22:514-520. Tolnay M, Spillantini MG, Goedert M, Ulrich J, Langui D, Probst A. Argyrophilic grain disease: widespread hyperphosphorylation of tau protein in limbic neurons. Acta Neuropathol. 1997;93:477-484. Sengupta U, Guerrero-Munoz MJ, Castillo-Carranza DL, et al. Pathological interface between oligomeric alpha-synuclein and tau in synucleinopathies. Biol Psychiat. 2015;78:672-683. Fernandez-Nogales M, Cabrera JR, Santos-Galindo M, et al. Huntington’s disease is a four-repeat tauopathy with tau nuclear rods. Nat Med. 2014;20:881-885. Anderson JM, Hampton DW, Patani R, et al. Abnormally phosphorylated tau is associated with neuronal and axonal loss in experimental autoimmune encephalomyelitis and multiple sclerosis. Brain. 2008;131:1736-1748. Grossman M, Elman L, McCluskey L, et al. Phosphorylated tau as a candidate biomarker for amyotrophic lateral sclerosis. JAMA Neurol. 2014;71:442-448. Dumanchin C, Camuzat A, Campion D, et al. Segregation of a missense mutation in the microtubule-associated protein tau gene with familial frontotemporal dementia and parkinsonism. Hum Mol Genet. 1998;7:1825-1829. Hutton M, Lendon CL, Rizzu P, et al. Association of missense and 5’-splice-site mutations in tau with the inherited dementia FTDP-17. Nature. 1998;393:702-705. Guo JL, Lee VM. Seeding of normal Tau by pathological Tau conformers drives pathogenesis of Alzheimer-like tangles. J Biol Chem. 2011;286:15317-15331. Gotz J, Chen F, Barmettler R, Nitsch RM. Tau filament formation in transgenic mice expressing P301L tau. J Biol Chem. 2001;276:529-534. Alonso Adel C, Mederlyova A, Novak M, Grundke-Iqbal I, Iqbal K. Promotion of hyperphosphorylation by frontotemporal dementia tau mutations. J Biol Chem. 2004;279:34873-34881. Mutations. http://www.alzforum.org/mutations. Accessed June 1, 2017. Desikan RS, Schork AJ, Wang Y, et al. Genetic overlap between Alzheimer’s disease and Parkinson’s disease at the MAPT locus. Mol Psychiatry. 2015;20:1588-1595. Ferrari R, Hernandez DG, Nalls MA, et al. Frontotemporal dementia and its subtypes: a genome-wide association study. Lancet Neurol. 2014;13:686-699. Alzheimer’s Association. 2017 Alzheimer’s disease facts and figures. Alzheimers Dement. 2017;13:325-373. Karakaya T, Fusser F, Prvulovic D, Hampel H. Treatment options for tauopathies. Curr Treat Options Neurol. 2012;14:126-136. Kang J, Lemaire HG, Unterbeck A, et al. The precursor of Alzheimer’s disease amyloid A4 protein resembles a cell-surface receptor. Nature. 1987;325:733-736. Salloway S, Sperling R, Gilman S, et al. A phase 2 multiple ascending dose trial of bapineuzumab in mild to moderate Alzheimer disease. Neurology. 2009;73:2061-2070. Sperling RA, Jack CR, Jr., Black SE, et al. Amyloid-related imaging abnormalities in amyloid-modifying therapeutic trials: recommendations from the Alzheimer’s Association Research Roundtable Workgroup. Alzheimers Dement. 2011;7:367-385. Doody RS, Raman R, Farlow M, et al. A phase 3 trial of semagacestat for treatment of Alzheimer’s disease. N Engl J Med. 2013;369:341-350. An Efficacy and Safety Trial of Verubecestat (MK-8931) in Mild to Moderate Alzheimer’s Disease (P07738). Microtubule-associated protein tau isoform 2 [Homo sapiens]. https://www.ncbi.nlm.nih.gov/protein/6754638?report=fasta. Accessed May 22, 2017. Hanger DP, Hughes K, Woodgett JR, Brion JP, Anderton BH. Glycogen synthase kinase-3 induces Alzheimer’s disease-like phosphorylation of tau: generation of paired helical filament epitopes and neuronal localisation of the kinase. Neurosci Lett. 1992;147:58-62. Lovestone S, Reynolds CH, Latimer D, et al. Alzheimer’s disease-like phosphorylation of the microtubule-associated protein tau by glycogen synthase kinase-3 in transfected mammalian cells. Curr Biol. 1994;4:1077-1086. Cho JH, Johnson GV. Glycogen synthase kinase 3beta phosphorylates tau at both primed and unprimed sites. Differential impact on microtubule binding. J Biol Chem. 2003;278:187-193. Asuni AA, Hooper C, Reynolds CH, Lovestone S, Anderton BH, Killick R. GSK3alpha exhibits beta-catenin and tau directed kinase activities that are modulated by Wnt. Eur J Neurosci. 2006;24:3387-3392. Sperber BR, Leight S, Goedert M, Lee VM. Glycogen synthase kinase-3 beta phosphorylates tau protein at multiple sites in intact cells. Neurosci Lett. 1995;197:149-153. Hosoi T, Uchiyama M, Okumura E, et al. Evidence for cdk5 as a major activity phosphorylating tau protein in porcine brain extract. J Biochem. 1995;117:741-749. Baumann K, Mandelkow EM, Biernat J, Piwnica-Worms H, Mandelkow E. Abnormal Alzheimer-like phosphorylation of tau-protein by cyclin-dependent kinases cdk2 and cdk5. FEBS Lett. 1993;336:417-424. Reynolds CH, Betts JC, Blackstock WP, Nebreda AR, Anderton BH. Phosphorylation sites on tau identified by nanoelectrospray mass spectrometry: differences in vitro between the mitogen-activated protein kinases ERK2, c-Jun N-terminal kinase and P38, and glycogen synthase kinase-3beta. J Neurochem. 2000;74:1587-1595. Reynolds CH, Utton MA, Gibb GM, Yates A, Anderton BH. Stress-activated protein kinase/c-jun N-terminal kinase phosphorylates tau protein. J Neurochem. 1997;68:1736-1744. Goedert M, Hasegawa M, Jakes R, Lawler S, Cuenda A, Cohen P. Phosphorylation of microtubule-associated protein tau by stress-activated protein kinases. FEBS Lett. 1997;409:57-62. Ujiie S, Hatano T, Kubo S, et al. LRRK2 I2020T mutation is associated with tau pathology. Parkinsonism Relat Disord. 2012;18:819-823. Kawakami F, Yabata T, Ohta E, et al. LRRK2 phosphorylates tubulin-associated tau but not the free molecule: LRRK2-mediated regulation of the tau-tubulin association and neurite outgrowth. PLoS One. 2012;7:e30834. Bailey RM, Covy JP, Melrose HL, et al. LRRK2 phosphorylates novel tau epitopes and promotes tauopathy. Acta Neuropathol. 2013;126:809-827. Ksiezak-Reding H, Pyo HK, Feinstein B, Pasinetti GM. Akt/PKB kinase phosphorylates separately Thr212 and Ser214 of tau protein in vitro. Biochim Biophys Acta. 2003;1639:159-168. Derkinderen P, Scales TM, Hanger DP, et al. Tyrosine 394 is phosphorylated in Alzheimer’s paired helical filament tau and in fetal tau with c-Abl as the candidate tyrosine kinase. J Neurosci. 2005;25:6584-6593. Lee G, Thangavel R, Sharma VM, et al. Phosphorylation of tau by fyn: implications for Alzheimer’s disease. J Neurosci. 2004;24:2304-2312. Cavallini A, Brewerton S, Bell A, et al. An unbiased approach to identifying tau kinases that phosphorylate tau at sites associated with Alzheimer disease. J Biol Chem. 2013;288:23331-23347. Biernat J, Gustke N, Drewes G, Mandelkow EM, Mandelkow E. Phosphorylation of Ser262 strongly reduces binding of tau to microtubules: distinction between PHF-like immunoreactivity and microtubule binding. Neuron. 1993;11:153-163. Sibille N, Huvent I, Fauquant C, et al. Structural characterization by nuclear magnetic resonance of the impact of phosphorylation in the proline-rich region of the disordered Tau protein. Proteins. 2012;80:454-462. Busciglio J, Lorenzo A, Yeh J, Yankner BA. Beta-amyloid fibrils induce tau phosphorylation and loss of microtubule binding. Neuron. 1995;14:879-888. Bramblett GT, Goedert M, Jakes R, Merrick SE, Trojanowski JQ, Lee VM. Abnormal tau phosphorylation at Ser396 in Alzheimer’s disease recapitulates development and contributes to reduced microtubule binding. Neuron. 1993;10:1089-1099. Sontag E, Nunbhakdi-Craig V, Lee G, Bloom GS, Mumby MC. Regulation of the phosphorylation state and microtubule-binding activity of Tau by protein phosphatase 2A. Neuron. 1996;17:1201-1207. Saito T, Ishiguro K, Uchida T, Miyamoto E, Kishimoto T, Hisanaga S. In situ dephosphorylation of tau by protein phosphatase 2A and 2B in fetal rat primary cultured neurons. FEBS Lett. 1995;376:238-242. Liu F, Grundke-Iqbal I, Iqbal K, Gong CX. Contributions of protein phosphatases PP1, PP2A, PP2B and PP5 to the regulation of tau phosphorylation. Eur J Neurosci. 2005;22:1942-1950. Liu F, Iqbal K, Grundke-Iqbal I, Rossie S, Gong CX. Dephosphorylation of tau by protein phosphatase 5: impairment in Alzheimer’s disease. J Biol Chem. 2005;280:1790-1796. Rahman A, Grundke-Iqbal I, Iqbal K. Phosphothreonine-212 of Alzheimer abnormally hyperphosphorylated tau is a preferred substrate of protein phosphatase-1. Neurochem Res. 2005;30:277-287. Gong CX, Lidsky T, Wegiel J, Zuck L, Grundke-Iqbal I, Iqbal K. Phosphorylation of microtubule-associated protein tau is regulated by protein phosphatase 2A in mammalian brain. Implications for neurofibrillary degeneration in Alzheimer’s disease. J Biol Chem. 2000;275:5535-5544. Zhang X, Li F, Bulloj A, et al. Tumor-suppressor PTEN affects tau phosphorylation, aggregation, and binding to microtubules. FASEB J. 2006;20:1272-1274. Sengupta A, Wu Q, Grundke-Iqbal I, Iqbal K, Singh TJ. Potentiation of GSK-3-catalyzed Alzheimer-like phosphorylation of human tau by cdk5. Mol Cell Biochem. 1997;167:99-105. Isagawa T, Mukai H, Oishi K, et al. Dual effects of PKNalpha and protein kinase C on phosphorylation of tau protein by glycogen synthase kinase-3beta. Biochem Biophys Res Commun. 2000;273:209-212. Vershinin M, Carter BC, Razafsky DS, King SJ, Gross SP. Multiple-motor based transport and its regulation by Tau. Proc Natl Acad Sci U S A. 2007;104:87-92. Cuchillo-Ibanez I, Seereeram A, Byers HL, et al. Phosphorylation of tau regulates its axonal transport by controlling its binding to kinesin. FASEB J. 2008;22:3186-3195. Jameson L, Frey T, Zeeberg B, Dalldorf F, Caplow M. Inhibition of microtubule assembly by phosphorylation of microtubule-associated proteins. Biochemistry. 1980;19:2472-2479. Lindwall G, Cole RD. Phosphorylation affects the ability of tau protein to promote microtubule assembly. J Biol Chem. 1984;259:5301-5305. Makani V, Zhang B, Han H, et al. Evaluation of the brain-penetrant microtubule-stabilizing agent, dictyostatin, in the PS19 tau transgenic mouse model of tauopathy. Acta Neuropathol Commun. 2016;4:106. Barten DM, Fanara P, Andorfer C, et al. Hyperdynamic microtubules, cognitive deficits, and pathology are improved in tau transgenic mice with low doses of the microtubule-stabilizing agent BMS-241027. J Neurosci. 2012;32:7137-7145. Zhang B, Carroll J, Trojanowski JQ, et al. The microtubule-stabilizing agent, epothilone D, reduces axonal dysfunction, neurotoxicity, cognitive deficits, and Alzheimer-like pathology in an interventional study with aged tau transgenic mice. J Neurosci. 2012;32:3601-3611. Alonso AC, Grundke-Iqbal I, Iqbal K. Alzheimer’s disease hyperphosphorylated tau sequesters normal tau into tangles of filaments and disassembles microtubules. Nat Med. 1996;2:783-787. Alonso AC, Zaidi T, Grundke-Iqbal I, Iqbal K. Role of abnormally phosphorylated tau in the breakdown of microtubules in Alzheimer disease. Proc Natl Acad Sci U S A. 1994;91:5562-5566. Clavaguera F, Akatsu H, Fraser G, et al. Brain homogenates from human tauopathies induce tau inclusions in mouse brain. Proc Natl Acad Sci U S A. 2013;110:9535-9540. Michel CH, Kumar S, Pinotsi D, et al. Extracellular monomeric tau protein is sufficient to initiate the spread of tau protein pathology. J Biol Chem. 2014;289:956-967. Lasagna-Reeves CA, Castillo-Carranza DL, Sengupta U, et al. Alzheimer brain-derived tau oligomers propagate pathology from endogenous tau. Sci Rep. 2012;2:700. Lasagna-Reeves CA, Castillo-Carranza DL, Sengupta U, Clos AL, Jackson GR, Kayed R. Tau oligomers impair memory and induce synaptic and mitochondrial dysfunction in wild-type mice. Mol Neurodegener. 2011;6:39. Cowan CM, Quraishe S, Hands S, et al. Rescue from tau-induced neuronal dysfunction produces insoluble tau oligomers. Sci Rep. 2015;5:17191. Congdon EE, Kim S, Bonchak J, Songrug T, Matzavinos A, Kuret J. Nucleation-dependent tau filament formation: the importance of dimerization and an estimation of elementary rate constants. J Biol Chem. 2008;283:13806-13816. Friedhoff P, von Bergen M, Mandelkow EM, Davies P, Mandelkow E. A nucleated assembly mechanism of Alzheimer paired helical filaments. Proc Natl Acad Sci U S A. 1998;95:15712-15717. Sahara N, Maeda S, Murayama M, et al. Assembly of two distinct dimers and higher-order oligomers from full-length tau. Eur J Neurosci. 2007;25:3020-3029. Ihara Y, Nukina N, Miura R, Ogawara M. Phosphorylated tau protein is integrated into paired helical filaments in Alzheimer’s disease. J Biochem. 1986;99:1807-1810. Goedert M, Wischik CM, Crowther RA, Walker JE, Klug A. Cloning and sequencing of the cDNA encoding a core protein of the paired helical filament of Alzheimer disease: identification as the microtubule-associated protein tau. Proc Natl Acad Sci U S A. 1988;85:4051-4055. Grundke-Iqbal I, Iqbal K, Quinlan M, Tung YC, Zaidi MS, Wisniewski HM. Microtubule-associated protein tau. A component of Alzheimer paired helical filaments. J Biol Chem. 1986;261:6084-6089. Maeda S, Sahara N, Saito Y, et al. Granular tau oligomers as intermediates of tau filaments. Biochemistry. 2007;46:3856-3861. Crowther RA, Wischik CM. Image reconstruction of the Alzheimer paired helical filament. EMBO J. 1985;4:3661-3665. Kidd M. Paired helical filaments in electron microscopy of Alzheimer’s disease. Nature. 1963;197:192-193. Wisniewski HM, Narang HK, Terry RD. Neurofibrillary tangles of paired helical filaments. J Neurol Sci. 1976;27:173-181. Lennox G, Lowe J, Morrell K, Landon M, Mayer RJ. Ubiquitin is a component of neurofibrillary tangles in a variety of neurodegenerative diseases. Neurosci Lett. 1988;94:211-217. Perry G, Friedman R, Shaw G, Chau V. Ubiquitin is detected in neurofibrillary tangles and senile plaque neurites of Alzheimer disease brains. Proc Natl Acad Sci U S A. 1987;84:3033-3036. Cork LC, Sternberger NH, Sternberger LA, Casanova MF, Struble RG, Price DL. Phosphorylated neurofilament antigens in neurofibrillary tangles in Alzheimer’s disease. J Neuropathol Exp Neurol. 1986;45:56-64. Perry G, Richey PL, Siedlak SL, et al. Immunocytochemical evidence that the beta-protein precursor is an integral component of neurofibrillary tangles of Alzheimer’s disease. Am J Pathol. 1993;143:1586-1593. Hasegawa M, Arai T, Ihara Y. Immunochemical evidence that fragments of phosphorylated MAP5 (MAP1B) are bound to neurofibrillary tangles in Alzheimer’s disease. Neuron. 1990;4:909-918. Perry G, Mulvihill P, Manetto V, Autilio-Gambetti L, Gambetti P. Immunocytochemical properties of Alzheimer straight filaments. J Neurosci. 1987;7:3736-3738. Crowther RA. Straight and paired helical filaments in Alzheimer disease have a common structural unit. Proc Natl Acad Sci U S A. 1991;88:2288-2292. Perry G, Kawai M, Tabaton M, et al. Neuropil threads of Alzheimer’s disease show a marked alteration of the normal cytoskeleton. J Neurosci. 1991;11:1748-1755. Iqbal K, Zaidi T, Bancher C, Grundke-Iqbal I. Alzheimer paired helical filaments. Restoration of the biological activity by dephosphorylation. FEBS Lett. 1994;349:104-108. Wang JZ, Gong CX, Zaidi T, Grundke-Iqbal I, Iqbal K. Dephosphorylation of Alzheimer paired helical filaments by protein phosphatase-2A and -2B. J Biol Chem. 1995;270:4854-4860. Ishizawa T, Mattila P, Davies P, Wang D, Dickson DW. Colocalization of tau and alpha-synuclein epitopes in Lewy bodies. J Neuropathol Exp Neurol. 2003;62:389-397. Arima K, Mizutani T, Alim MA, et al. NACP/alpha-synuclein and tau constitute two distinctive subsets of filaments in the same neuronal inclusions in brains from a family of parkinsonism and dementia with Lewy bodies: double-immunolabeling fluorescence and electron microscopic studies. Acta Neuropathol. 2000;100:115-121. Galloway PG, Bergeron C, Perry G. The presence of tau distinguishes Lewy bodies of diffuse Lewy body disease from those of idiopathic Parkinson disease. Neurosci Lett. 1989;100:6-10. Love S, Saitoh T, Quijada S, Cole GM, Terry RD. Alz-50, ubiquitin and tau immunoreactivity of neurofibrillary tangles, Pick bodies and Lewy bodies. J Neuropathol Exp Neurol. 1988;47:393-405. Shiryaev N, Jouroukhin Y, Giladi E, et al. NAP protects memory, increases soluble tau and reduces tau hyperphosphorylation in a tauopathy model. Neurobiol Dis. 2009;34:381-388. Boxer AL, Lang AE, Grossman M, et al. Davunetide in patients with progressive supranuclear palsy: a randomised, double-blind, placebo-controlled phase 2/3 trial. Lancet Neurol. 2014;13:676-685. Morimoto BH, Schmechel D, Hirman J, et al. A double-blind, placebo-controlled, ascending-dose, randomized study to evaluate the safety, tolerability and effects on cognition of AL-108 after 12 weeks of intranasal administration in subjects with mild cognitive impairment. Dement Geriatr Cogn Disord. 2013;35:325-336. Zhang JY, Liu SJ, Li HL, Wang JZ. Microtubule-associated protein tau is a substrate of ATP/Mg(2+)-dependent proteasome protease system. J Neural Transm (Vienna). 2005;112:547-555. David DC, Layfield R, Serpell L, Narain Y, Goedert M, Spillantini MG. Proteasomal degradation of tau protein. J Neurochem. 2002;83:176-185. Ikeda K, Akiyama H, Arai T, et al. Neurons containing Alz-50-immunoreactive granules around the cerebral infarction: evidence for the lysosomal degradation of altered tau in human brain? Neurosci Lett. 2000;284:187-189. Webb JL, Ravikumar B, Atkins J, Skepper JN, Rubinsztein DC. Alpha-Synuclein is degraded by both autophagy and the proteasome. J Biol Chem. 2003;278:25009-25013. Berger Z, Ravikumar B, Menzies FM, et al. Rapamycin alleviates toxicity of different aggregate-prone proteins. Hum Mol Genet. 2006;15:433-442. Kruger U, Wang Y, Kumar S, Mandelkow EM. Autophagic degradation of tau in primary neurons and its enhancement by trehalose. Neurobiol Aging. 2012;33:2291-2305. Allen B, Ingram E, Takao M, et al. Abundant tau filaments and nonapoptotic neurodegeneration in transgenic mice expressing human P301S tau protein. J Neurosci. 2002;22:9340-9351. Congdon EE, Wu JW, Myeku N, et al. Methylthioninium chloride (methylene blue) induces autophagy and attenuates tauopathy in vitro and in vivo. Autophagy. 2012;8:609-622. Medina DX, Caccamo A, Oddo S. Methylene blue reduces abeta levels and rescues early cognitive deficit by increasing proteasome activity. Brain Pathol. 2011;21:140-149. Hara T, Nakamura K, Matsui M, et al. Suppression of basal autophagy in neural cells causes neurodegenerative disease in mice. Nature. 2006;441:885-889. Komatsu M, Waguri S, Chiba T, et al. Loss of autophagy in the central nervous system causes neurodegeneration in mice. Nature. 2006;441:880-884. Khandelwal PJ, Herman AM, Hoe HS, Rebeck GW, Moussa CE. Parkin mediates beclin-dependent autophagic clearance of defective mitochondria and ubiquitinated Abeta in AD models. Hum Mol Genet. 2011;20:2091-2102. Lonskaya I, Shekoyan AR, Hebron ML, Desforges N, Algarzae NK, Moussa CE. Diminished parkin solubility and co-localization with intraneuronal amyloid-beta are associated with autophagic defects in Alzheimer’s disease. J Alzheimers Dis. 2013;33:231-247. Lonskaya I, Desforges NM, Hebron ML, Moussa CE. Ubiquitination increases parkin activity to promote autophagic alpha-synuclein clearance. PLoS One. 2013;8:e83914. Hebron ML, Lonskaya I, Moussa CE. Tyrosine kinase inhibition facilitates autophagic SNCA/alpha-synuclein clearance. Autophagy. 2013;9:1249-1250. Wischik CM, Staff RT, Wischik DJ, et al. Tau aggregation inhibitor therapy: an exploratory phase 2 study in mild or moderate Alzheimer’s disease. J Alzheimers Dis. 2015;44:705-720. Cancino GI, Perez de Arce K, Castro PU, Toledo EM, von Bernhardi R, Alvarez AR. c-Abl tyrosine kinase modulates tau pathology and Cdk5 phosphorylation in AD transgenic mice. Neurobiol Aging. 2011;32:1249-1261. Jing Z, Caltagarone J, Bowser R. Altered subcellular distribution of c-Abl in Alzheimer’s disease. J Alzheimers Dis. 2009;17:409-422. Lonskaya I, Hebron ML, Desforges NM, Franjie A, Moussa CE. Tyrosine kinase inhibition increases functional parkin-Beclin-1 interaction and enhances amyloid clearance and cognitive performance. EMBO Mol Med. 2013;5:1247-1262. Lonskaya I, Hebron ML, Desforges NM, Schachter JB, Moussa CE. Nilotinib-induced autophagic changes increase endogenous parkin level and ubiquitination, leading to amyloid clearance. J Mol Med (Berl). 2014;92:373-386. Hebron ML, Lonskaya I, Olopade P, Selby ST, Pagan F, Moussa CE. Tyrosine kinase inhibition regulates early systemic immune changes and modulates the neuroimmune response in alpha-synucleinopathy. J Clin Cell Immunol. 2014;5:259. Imamura K, Izumi Y, Watanabe A, et al. The Src/c-Abl pathway is a potential therapeutic target in amyotrophic lateral sclerosis. Sci Transl Med. 2017;9:eaaf3962. Gardner LE, White JD, Eimerbrink MJ, Boehm GW, Chumley MJ. Imatinib methanesulfonate reduces hyperphosphorylation of tau following repeated peripheral exposure to lipopolysaccharide. Neuroscience. 2016;331:72-77. Theunis C, Crespo-Biel N, Gafner V, et al. Efficacy and safety of a liposome-based vaccine against protein Tau, assessed in tau. P301L mice that model tauopathy. PLoS One. 2013;8:e72301. Yanamandra K, Kfoury N, Jiang H, et al. Anti-tau antibodies that block tau aggregate seeding in vitro markedly decrease pathology and improve cognition in vivo. Neuron. 2013;80:402-414. Yanamandra K, Jiang H, Mahan TE, et al. Anti-tau antibody reduces insoluble tau and decreases brain atrophy. Ann Clin Transl Neurol. 2015;2:278-288. Troquier L, Caillierez R, Burnouf S, et al. Targeting phospho-Ser422 by active Tau Immunotherapy in the THYTau22 mouse model: a suitable therapeutic approach. Curr Alzheimer Res. 2012;9:397-405. Boutajangout A, Ingadottir J, Davies P, Sigurdsson EM. Passive immunization targeting pathological phospho-tau protein in a mouse model reduces functional decline and clears tau aggregates from the brain. J Neurochem. 2011;118:658-667. Boimel M, Grigoriadis N, Lourbopoulos A, Haber E, Abramsky O, Rosenmann H. Efficacy and safety of immunization with phosphorylated tau against neurofibrillary tangles in mice. Exp Neurol. 2010;224:472-485. Asuni AA, Boutajangout A, Quartermain D, Sigurdsson EM. Immunotherapy targeting pathological tau conformers in a tangle mouse model reduces brain pathology with associated functional improvements. J Neurosci. 2007;27:9115-9129. Bi M, Ittner A, Ke YD, Gotz J, Ittner LM. Tau-targeted immunization impedes progression of neurofibrillary histopathology in aged P301L tau transgenic mice. PLoS One. 2011;6:e26860. Gu J, Congdon EE, Sigurdsson EM. 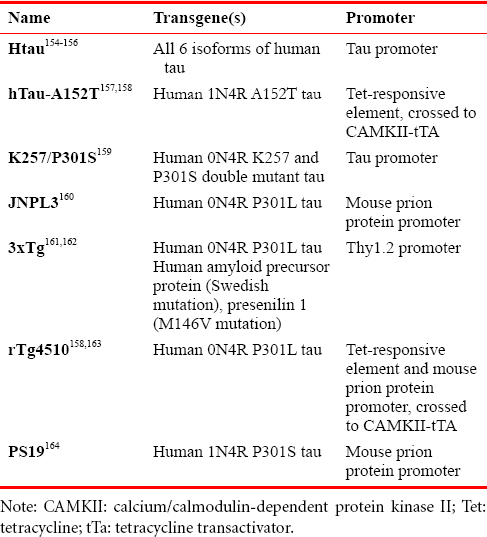 Two novel Tau antibodies targeting the 396/404 region are primarily taken up by neurons and reduce Tau protein pathology. J Biol Chem. 2013;288:33081-33095. Dai CL, Tung YC, Liu F, Gong CX, Iqbal K. Tau passive immunization inhibits not only tau but also Abeta pathology. Alzheimers Res Ther. 2017;9:1. Collin L, Bohrmann B, Gopfert U, Oroszlan-Szovik K, Ozmen L, Gruninger F. Neuronal uptake of tau/pS422 antibody and reduced progression of tau pathology in a mouse model of Alzheimer’s disease. Brain. 2014;137:2834-2846. Gauthier S, Feldman HH, Schneider LS, et al. Efficacy and safety of tau-aggregation inhibitor therapy in patients with mild or moderate Alzheimer’s disease: a randomised, controlled, double-blind, parallel-arm, phase 3 trial. Lancet. 2016;388:2873-2884. Pagan F, Hebron M, Valadez EH, et al. Nilotinib Effects in Parkinson’s disease and Dementia with Lewy bodies. J Parkinsons Dis. 2016;6:503-517. Lee WJ, Moon J, Kim TJ, et al. The c-Abl inhibitor, nilotinib, as a potential therapeutic agent for chronic cerebellar ataxia. J Neuroimmunol. 2017;309:82-87. Nygaard HB, Wagner AF, Bowen GS, et al. A phase Ib multiple ascending dose study of the safety, tolerability, and central nervous system availability of AZD0530 (saracatinib) in Alzheimer’s disease. Alzheimers Res Ther. 2015;7:35. Kontsekova E, Zilka N, Kovacech B, Skrabana R, Novak M. Identification of structural determinants on tau protein essential for its pathological function: novel therapeutic target for tau immunotherapy in Alzheimer’s disease. Alzheimers Res Ther. 2014;6:45. Kontsekova E, Zilka N, Kovacech B, Novak P, Novak M. First-in-man tau vaccine targeting structural determinants essential for pathological tau-tau interaction reduces tau oligomerisation and neurofibrillary degeneration in an Alzheimer’s disease model. Alzheimers Res Ther. 2014;6:44. Novak P, Schmidt R, Kontsekova E, et al. Safety and immunogenicity of the tau vaccine AADvac1 in patients with Alzheimer’s disease: a randomised, double-blind, placebo-controlled, phase 1 trial. Lancet Neurol. 2017;16:123-134. Lonskaya I, Hebron M, Chen W, Schachter J, Moussa C. Tau deletion impairs intracellular beta-amyloid-42 clearance and leads to more extracellular plaque deposition in gene transfer models. Mol Neurodegener. 2014;9:46. Utton MA, Noble WJ, Hill JE, Anderton BH, Hanger DP. Molecular motors implicated in the axonal transport of tau and alpha-synuclein. J Cell Sci. 2005;118:4645-4654. Yang YL, Li GH, Zhao DY, et al. Computational discovery and experimental verification of tyrosine kinase inhibitor pazopanib for the reversal of memory and cognitive deficits in rat model neurodegeneration. Chem Sci. 2015;6:2812-2821. Piette F, Belmin J, Vincent H, et al. Masitinib as an adjunct therapy for mild-to-moderate Alzheimer’s disease: a randomised, placebo-controlled phase 2 trial. Alzheimers Res Ther. 2011;3:16. Activity of Masitinib (AB1010) in Mild to Moderate Alzheimer’s Disease. A Phase 3 Study to Evaluate the Safety and Efficacy of Masitinib in Patients With Mild to Moderate Alzheimer’s Disease. Yamada K, Cirrito JR, Stewart FR, et al. In vivo microdialysis reveals age-dependent decrease of brain interstitial fluid tau levels in P301S human tau transgenic mice. J Neurosci. 2011;31:13110-13117. Espinoza M, de Silva R, Dickson DW, Davies P. Differential incorporation of tau isoforms in Alzheimer’s disease. J Alzheimers Dis. 2008;14:1-16. Arai T, Ikeda K, Akiyama H, et al. Distinct isoforms of tau aggregated in neurons and glial cells in brains of patients with Pick’s disease, corticobasal degeneration and progressive supranuclear palsy. Acta Neuropathol. 2001;101:167-173.
de Silva R, Lashley T, Strand C, et al. An immunohistochemical study of cases of sporadic and inherited frontotemporal lobar degeneration using 3R- and 4R-specific tau monoclonal antibodies. Acta Neuropathol. 2006;111:329-340. Togo T, Sahara N, Yen SH, et al. Argyrophilic grain disease is a sporadic 4-repeat tauopathy. J Neuropathol Exp Neurol. 2002;61:547-556. Tolnay M, Sergeant N, Ghestem A, et al. Argyrophilic grain disease and Alzheimer’s disease are distinguished by their different distribution of tau protein isoforms. Acta Neuropathol. 2002;104:425-434. Duff K, Knight H, Refolo LM, et al. Characterization of pathology in transgenic mice over-expressing human genomic and cDNA tau transgenes. Neurobiol Dis. 2000;7:87-98. Andorfer C, Kress Y, Espinoza M, et al. Hyperphosphorylation and aggregation of tau in mice expressing normal human tau isoforms. J Neurochem. 2003;86:582-590. Tucker KL, Meyer M, Barde YA. Neurotrophins are required for nerve growth during development. Nat Neurosci. 2001;4:29-37. Maeda S, Djukic B, Taneja P, et al. Expression of A152T human tau causes age-dependent neuronal dysfunction and loss in transgenic mice. EMBO Rep. 2016;17:530-551. Mayford M, Bach ME, Huang YY, Wang L, Hawkins RD, Kandel ER. Control of memory formation through regulated expression of a CaMKII transgene. Science. 1996;274:1678-1683. Rosenmann H, Grigoriadis N, Eldar-Levy H, et al. A novel transgenic mouse expressing double mutant tau driven by its natural promoter exhibits tauopathy characteristics. Exp Neurol. 2008;212:71-84. Lewis J, McGowan E, Rockwood J, et al. Neurofibrillary tangles, amyotrophy and progressive motor disturbance in mice expressing mutant (P301L) tau protein. Nat Genet. 2000;25:402-405. Oddo S, Caccamo A, Shepherd JD, et al. Triple-transgenic model of Alzheimer’s disease with plaques and tangles: intracellular Abeta and synaptic dysfunction. Neuron. 2003;39:409-421. Guo Q, Fu W, Sopher BL, et al. Increased vulnerability of hippocampal neurons to excitotoxic necrosis in presenilin-1 mutant knock-in mice. Nat Med. 1999;5:101-106. Santacruz K, Lewis J, Spires T, et al. Tau suppression in a neurodegenerative mouse model improves memory function. Science. 2005;309:476-481. Yoshiyama Y, Higuchi M, Zhang B, et al. Synapse loss and microglial activation precede tangles in a P301S tauopathy mouse model. Neuron. 2007;53:337-351. All authors contributed to the writing of this manuscript. This manuscript has been read and approved by all the authors, and the requirements for authorship have been met. The authors believe this manuscript represents honest work. Charbel E-H. Moussa is listed as an inventor on a Georgetown University intellectual property patent to use tyrosine kinase inhibitors for the treatment of neurodegenerative diseases.